New Documentary: "The Saga of the Musketeers Part One & Two"
The Making "The Three Musketeers"
Subtitles: English for the hearing impared. Anchor Bay has answered the prayers of movie fans worldwide. Anchor Bay's collector's set "The Complete Musketeers" brings two of Richard Lester's three "Musketeer's" films to a new generation. 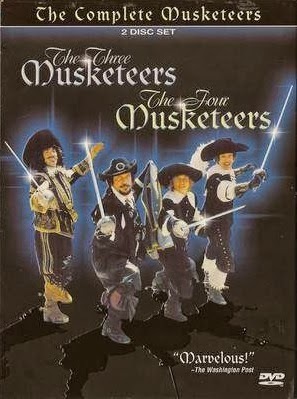 The name "The Complete Musketeers" is not completely true as director Lester reunited his all star cast for "The Return of the Musketeers" in 1989. These epic films were actually filmed to be one film. "The Three Musketeers" was to be released as a major roadshow picture with an intermission. Instead, the Salkinds (the film's producers) decided to cut the film into two films. The good news is, both films are excellent. Some fans of older film versions of the Dumas classic resented the comic elements found in this film. Those who have read the book will find that Lester's version is the closet adaptation of the book into film. 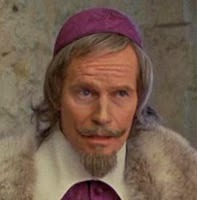 "The Three Musketeers" follows the adventures of the young D'Artagnan (Michael York) as he travels to Paris to follow in his father's footsteps by joining King Louis XIII's (Jean-Pierre Cassel) Musketeers. On his first day in Paris, the brash young man manages to insult three of the best Musketeers in separate incidents. All three challenge D'Artagnan to duels. His first duel is with Athos (Oliver Reed). 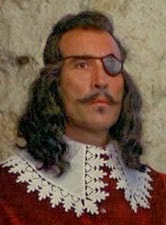 Athos's two companions are Aramis (Richard Chamberland) and Porthos (Frank Finlay). They are amazed to find that Athos is dueling the same man they are scheduled to fight. Before Athos and D'Artagnan can start, the Cardinal's Guards arrive to arrest them. What follows is one of the best sword fight scenes of all time. 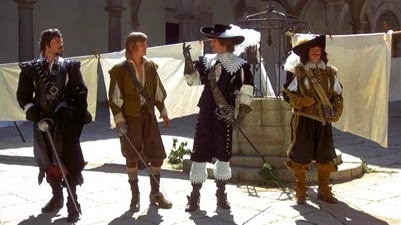 D'Artagnan fights along side the three Musketeers as they fight the six guards of Cardinal Richelieu (Charlton Heston). Once Lester introduces the four main characters, the film wastes no time developing the intricate plot. 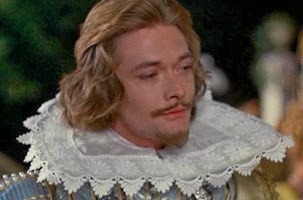 The first film deals with Cardinal Richelieu's machinations to uncover Queen Anne's (Geraldine Chaplin) affair with Britain's Prime Minister, the Duke of Buckingham (Simon Ward). The Cardinal's main agents are the deadly swordsman the Count de Rochefort (Christopher Lee) and the seductive Milady de Winter (Faye Dunaway). Protecting the Queen's honor are the Musketeers aided by the Queen's seamstress, Constance de Bonancieux (Raquel Welch) and D'Artaqgnan's man servant Planchet (Roy Kinnear). I'll leave further details of the plot to you to discover. Lester's films show just how dirty and filthy life in the early 1600s was. The divide between the haves and have-nots was very wide. Both films have excellent production values: great costumes and sets. Having captured the look of 1625, Lester created some of the most memorable set pieces in swashbuckling history. In addition to the outstanding sword fights, the films boast a bawdy script and wonderful performances throughout. The innovative style Lester showed in his Beatle's films "A Hard Days Night" and "Help!" are evident in these two adventure films. I have always wanted to see the two films united as originally intended. Maybe someday. Until that day, this DVD collection is the best way to see these Richard Lester classics. "The Four Musketeers" was released one year after the first film. The movie continues the political plotting by Richelieu in his attempt to wrest power from the bumbling, cuckolded King Louis. The second film is darker in tone. France is at civil war. England is planning to send ship to support the rebellion. Main characters die. The second half doesn't reach the comic tone set in the first half, but it is still an excellent film. Great movies, picture, sound and extras. These DVD were mastered from the original vault materials. The films were lovingly restored and transferred. No artifacts were noticed. There were a couple of delineation problems. Nothing too distracting. I only noticed because I was looking hard to find them. The "tennis" scene has some problems in the shadows. The colors are rich and well saturated. Excellent flesh tones. Nice definition of detail in the shadows for the most part. I saw both films in the theater way back when. These transfers look as good if not better than what I remember from the 70s. These soundtracks would have been great converted to stereo. Oh well, I guess I'll have to wait. As they stand, the soundtracks are as rich and lush as a Mono track can bee. Both films are filled with audible comments by extras and crowd members. Many of these are comic gems. All the dialogue comes across crystal clear. The clangs of crossed swords are also excellent. Lalo Schifrin's core captures the epic, adventurous tone of the film. His score is blended with the dialogue and sound effects splendidly. Nice balance between the ranges. Both highs and lows are rich and full. The menu is a colorful variation on the first film's credit sequence. Nice animation, excellent use of Schifrin's musical score. Easy to navigate. No Easter Eggs found. "The Saga of the Musketeers" is a 50-minute documentary on the making of these great films. The new documentary contains interviews with Charlton Heston, Christopher Lee, Raquel Welch, Michael York, Frank Finlay, and the younger Salkind. There are nice tributes to cast deceased members Oliver Reed, Spike Milligan and Roy Kinnear. The death of Kinnear was especially sad. He died in a horseback riding accident during the filming of "The Return of the Musketeers." I recently spoke to publicist Quinn Donahue while he was in Memphis during the filming of Alejandro Inarritu's "21 Grams." Mr. Donahue worked on all three Musketeer films. He was the one who drove Kinnear to the hospital. Mr. Donahue told me "I was the only one around who spoke Spanish (the movies were filmed in Spain) so I drove him to the hospital. He had a broken pelvis. He was conscious the whole way. We checked him in. He seemed to be doing all right. We were all shocked. He took a turn for the worse and died. I guess the injury was too much of a shock for his body. He was a dear funny man." This new documentary also includes behind the scenes footage of the actors practicing their sword skills. Christopher Lee provides some funny stories concerning the injuries inflicted on the cast members. The documentary also tells the tale of the decision to release the film as two movies and the lawsuits that followed. The actors were paid for one movie, but the producers got two films out of them. Very tricky these Salkinds! The DVD also includes a 7-minute featurette that was produced at the time of the original theatrical release. The featurette is cool for historical value. Much of what is in it is dealt with in the new documentary. The cover is embossed with the image of the four lead actors.Anchor Bay produces the best talent bios of any DVD company in the worlds. There are bios on the director and all of the stars. Anchor Bay's bios are multiple screens of text covering the person's life and career. You have a lot of reading to do with these bios, considering the long and colorful careers of all involved. The trailers and TV spots have not been restored. You can use them to see how good the movies look. There is also a lengthy poster, publicity and still photo gallery. The collector's case folds out to four panels which are beautifully designed with photographs of the stars. This collector's edition is a must have DVD. Great films, performances, extras. Well worth the price of admission. 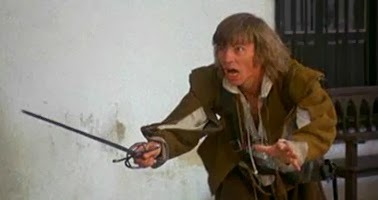 Maybe Anchor Bay will release the third Musketeer film down the road so we can really enjoy "The Complete Musketeers."